On Wednesday, Sept. 21, 2016, first-year students took a day off from classes to volunteer in the community. 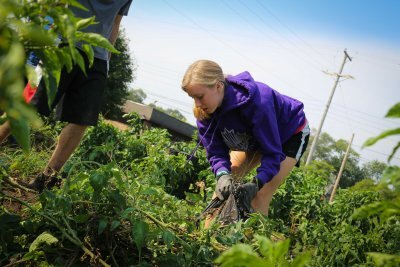 Students lent their time and talents to places like La Casa, Inc., The Boys and Girls Club, Soup of Success, Habitat for Humanity, Greencroft, Pathways Retreat Center, MCC and cleaned up the Elkhart River. Team Instruments vs. 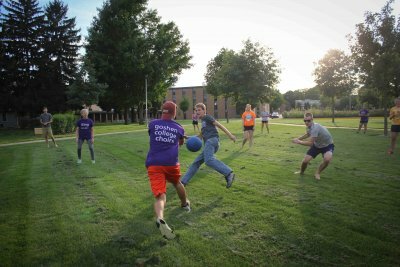 Team Voice matched up for the 4th annual Music Department Kick-A-Dilly Match on Wednesday, August 31 at the Mary K. Oyer Kickball Field just south of the Music Center. 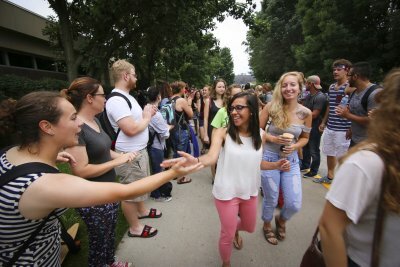 On Wednesday, Aug. 31, 2016, President Jim Brenneman opened the 2016-17 academic year with a speech about passionate learning, followed by the annual applause tunnel, a GC tradition that welcomes new and returning students back to campus. 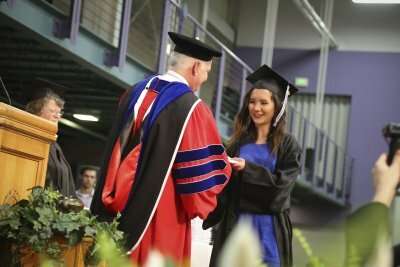 Goshen's 118th Commencement ceremony, with speaker Carrie Newcomer '80. The 18th annual Goshen College Student Academic Symposium was hosted in Goshen College’s Church-Chapel on Saturday, April 2, 2016. 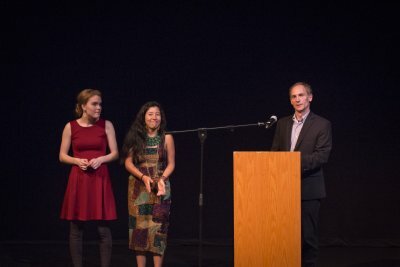 The mission of the symposium is to acknowledge original undergraduate and graduate research that plays an essential role in Goshen’s academic program and to encourage students and faculty to contribute to the larger conversation about knowledge that sustains the academy. The symposium brings together students and faculty members involved in original research and scholarly activity from all disciplines. 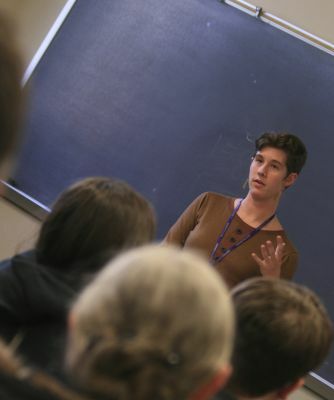 Besides thesis papers and investigations using the scientific method, presentations include expositions on the creative process and innovative techniques. 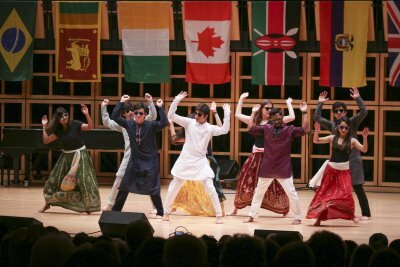 On March 12, 2016, student in the International Student Club provided a meal and performance to share and celebrate the food and culture of their home countries. Five Goshen College students spoke about issues close to their hearts during the college’s 2016 C. Henry Smith Peace Oratorical Contest on March. 15. 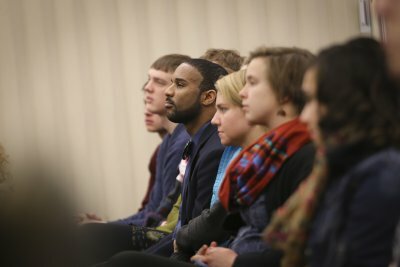 Goshen College students, faculty and community members focused on the life of Martin Luther King Jr. through the theme “Trouble I’ve Seen: Naming the Nightmare; Re-imagining the Dream” during the campus’ MLK Day annual public celebration events Jan. 16-18, 2016. 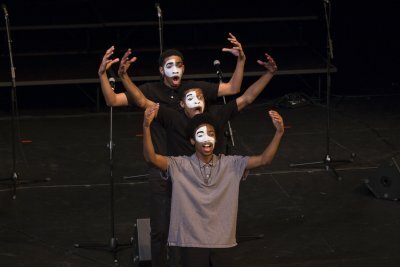 Voices-n-Harmony performed with special guests on Jan. 17, as part of Martin Luther King, Jr., celebration weekend.